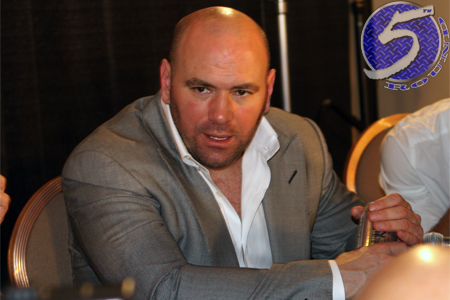 Shortly after it was revealed Tuesday that UFC light heavyweight champ Jon Jones had admitted himself into rehab after testing positive for cocaine, UFC president Dana white (pictured) issued a generic statement of support. On Wednesday’s episode of “America’s Pregame” on Fox Sports 1, White went into further detail about Jones’ latest mishap. White said he was “shocked” when he was first informed about Jones’ cocaine abuse, but believes there’s a silver lining that everyone should be grateful for. White said Jones was in good spirits when he spoke with him yesterday before entering his rehab stint. White plans on speaking with the talented, yet troubled 27-year-old again later today. “I was shocked. This is one of those situations where it’s so different than PEDs. You worry about the person first. Forget about the fighting and the work side,” White expressed. White said they were notified about Jones’ flunked drug exam before Saturday’s unanimous decision victory over Daniel Cormier at UFC 182, but they couldn’t pull him from the fight because there were signed contracts in place and Jones “has the right to fight.” Furthermore, Jones was popped for a “street drug” not a performance-enhancing drug. White revealed Cormier wasn’t immediately informed about Jones’ failed drug test because “he didn’t need to be.” Cormier found out yesterday like the rest of the world. White also confirmed that the Nevada Athletic Commission improperly tested Jones for drugs of abuse, such as cocaine. For pre-fight exams, fighters are only supposed to be screened for PEDs. White believes Jones’ latest setback is the wake up call he needs to get his life in order.